I'll put those rumors to rest. My effort in the pumpkin patch this year has been minimal. Too many other distractions, which is disappointing to me. I think I had some good genetics to grow on this year, but I haven't got out of the plants what I should have because of a lack of time. I would be the most suprised person if I had anything close to 1,300 pounds. An outside chance of being able to best last years pumpkins, but I'm not sure that will happen. 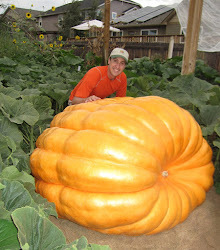 I measured the 1974 pumpkin today for the first time in 6 days. It only showed 1/2 inch in new growth on the circumference. It may be shutting down. The plant looks perfectly healthy however, so I'm not sure what is going on. 2145 seems to be growing at the same rate. Vine growth hasn't been good over the last few weeks. I hit it with additional nitrogen over the last two weeks, but it didn't seem to make much of a difference. Pumpkin seems to want to take everything.